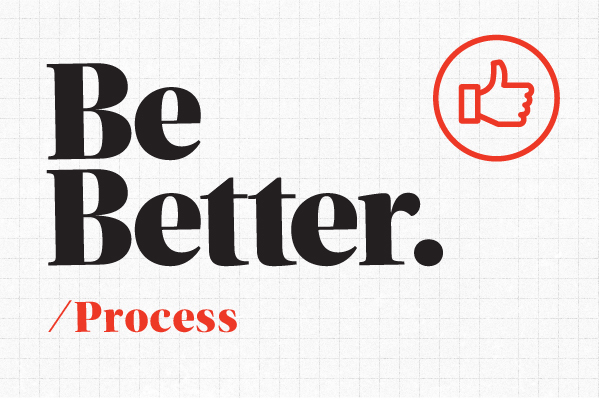 This is the sixth issue in the Be Better newsletter series. Sign up to get each issue delivered to your inbox. I want to talk about how we do the work we do. And by “we,” I don’t mean Sparkbox. I mean “we” as an industry. If you break it down far enough, our processes are really made of individual contributors who make thousands of tiny decisions all day long. And we make those decisions inside the context of where we work. We ask ourselves, “What is important to this customer?” or, “How have we accomplished this same task in previous projects?” We look around to our teammates and see if they’ve solved this problem before, if a worthwhile standard has already been established. Naturally, with each new person we add to a team, the possible number of ways we go about making decisions grows exponentially. We’re faced with a challenge to balance the absolute necessity of many unique perspectives with the potential chaos that comes with so much variety. I like to consider process through this lens because it demonstrates how critical an understanding of why we do what we do is to fostering collaboration. Understanding the “why” allows many unique individuals to find commonality in the range of possible solutions and gives them each the freedom to approach problems in their own way. The “why” establishes the guidelines and compass for our decision making. And, the more clear these guidelines are, the more confident individuals can be in their daily work. When I point that lens inward and read through just a few of our case studies it’s obvious that Sparkbox doesn’t have one process—our approach is unique to the customer, budget, and deadline. In my recent writing about discovery on web projects, I shared how almost all our engagements these days start with discovery. This greatly informs the approach we take toward our work at the individual project level. And while each process might morph to fit client needs, the way we make decisions stays constant. I believe that flexible consistency is driven by our core values—our answer to the question, “Why?” I want to share with you Sparkbox’s core values and explain how each of these drive the decisions we make, even in the daily grind of pushing pixels and writing code. I’m a firm believer in community. Humans are social animals and always have been. Life is easier when we live it together, and our jobs are easier when we work together. At Sparkbox, we added discovery efforts to our process as a way to support this belief. It’s impossible for me to take care of someone if I don’t understand their needs, and discovery is all about understanding our clients’ needs. We try hard to know and understand the people we’re working alongside. We try to see what is important to them and their customers, and in this way, we can take care of them. It starts in the discovery process, and it continues through the work. I used to believe that Sparkbox was made up of “problem-solvers” and not “order-takers.” In other words, when we would engage with a new customer, I would say things like, “Don’t tell me about the solution you need, tell me about the problem you’re trying to solve.” My intentions were honest—we are a team with deep expertise and many times our clients who choose to rely on that expertise get better solutions than they originally expected. However, over the years I’ve learned that stopping a customer from sharing how they imagine the problem will be solved actually prevents us from understanding their point of view. Certainly we offer expertise, but so do our customers. Our core value of always being respectful means we listen first and speak second. It means we work to understand our customers’ expectations and needs. We want Sparkbox to be welcoming to as many people from as many different backgrounds as possible. Valuable collaboration happens when you put folks with unique perspectives on the same problem. But that kind of diversity requires respect. No matter what problems we face in a project, remembering that those problems are always less important than the people we’re working alongside keeps us in a healthy state of mind. All the tiny decisions add up. At some point, “future you” is going to either curse or thank “past you” for your decisions. While we can’t see the future, we can relentlessly squint at it so we’re ready as it comes into focus. This plays out in a lot of ways. We encourage people to take care of themselves—pushing too hard in the short term can have negative long-term effects. In our project work, we try to choose technology that will last, and that means understanding the skills of the client team that’s responsible for maintaining it. It also means we’re not afraid to gently push on today’s constraints if we feel they could create too much trouble for tomorrow. And it means we work to demonstrate value early, then iterate toward more refined solutions. In terms of more practical information on “process,” I can offer you The Foundry, where our team documents our daily learnings. I can offer you some high-level workflow guidance for digital projects. But I honestly believe the best approach to finding the right process for your team is to figure out why you do this work. If you or your team struggles with process, maybe it’s time to nail down those values. Do this and you’ll be well on the way to getting the tiny decisions right, allowing your values to be the compass for whatever process is needed on a given project. Got something you'd like to discuss? Share your thoughts with @bencallahan or @hearsparkbox on Twitter and we'll consider the topic for a future newsletter or Foundry post. Drew shares the unique challenges our enterprise customers face and how we add value in tackling them.